Our biggest job in ministry is to cultivate environments that are favourable for people to engage in transformation with God. We can never force transformation or force growth. We cannot make something or someone grow. However there are sure a tonne of things we can do to cultivate the environment! As Paul says “I planted the seed, Apollos watered it, but God has been making it grow.” (1 Corinthians 3:6) You can’t make or will your plants to grow in your garden, but you can spend a lot of time, energy and even money to make sure those plants have everything they need to be able to grow. 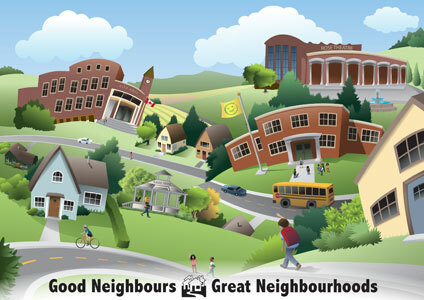 How do we create an environment that cultivates students with a heart for their neighbourhood? How do we cultivate students that want to see and join God’s work around them? 1. Model it a. In what you do together as a youth group/church – show what you mean by being God’s blessing to your neighbourhood. Model what it looks like to be God’s good news to others. Find opportunities for your youth group, and church or family to serve the neighbourhood around you – invite the neighbourhood to a party, offer to help the church neighbours with their yard work, fix up a local park, do a garbage clean-up in the area, thank the neighbours for putting up with your parking on the street on Sundays, serve the neighbours a meal with the intention of sitting down and getting to know them or find other ways your youth group could serve the unique neighbourhood where God has placed you. b. In your own life as a leader – make it normal to share how you are getting to know and seeking to be a blessing to the neighbours around your home or apartment. 2. Share stories and celebrate it – what we celebrate determines where we spend most of our energy. What gets celebrated in your youth group or church? Do you celebrate when groups or individuals have been God’s good news to others? Do you tell the stories of how youth and children are blessing their neighbourhood? Give opportunities for stories to be shared of how people are being the mouth, hands and feet of Jesus. Do you ask regularly – where do you see God’s goodness around you? Where do you see God at work around you? It might seem odd when you first start asking these questions every week, but soon youth catch on. As we share more stories it helps each of us keep our eyes open to God’s activity during the week. 3. Practice – we all need practice when we are trying something new to us. During youth group do role plays and have conversation about how to talk about what God is doing in your life in natural ways. Youth, just like so many of us, have learned to be quiet about our faith. We need to help each other recapture how to talk about our faith, not in a shoving it down others throat kind-of-way, but in a way that is authentic to who we are and authentic to what God is doing in our lives. Give youth opportunities to practice talking about the journey they are on with Christ, how they came to trust Christ, what God is teaching them today, and their questions about faith. 4. Pray regularly – let others hear you pray regularly for God to give each person opportunities to be His blessing to others this week. Invite people to keep their eyes open to what God is doing around them and how they can join in. 5. Talk about fear and courage – talk about the fears we face when we see an opportunity to be a blessing, see an opportunity to talk about faith or see an opportunity to invite someone to a youth group event. Talk about the courage it takes to push through, and God’s Holy Spirit presence with us as we take opportunities to follow Him in the world.